Last Night of the Proms… Mayor Rules Britannia! 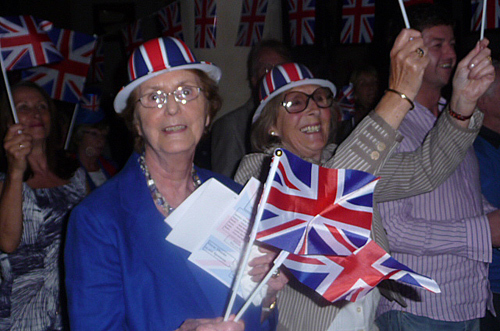 On Saturday night St Mary’s Church was decked out with union jack bunting and was out sold out for the first ever Last Night of the Proms Concert in Henley featuring the Henley Symphony Orchestra. The second half of the concert was a live feed on a big screen of the BBC Proms from the Royal Albert Hall. 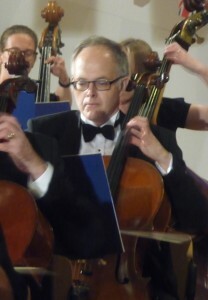 The Henley Symphony Orchestra (over 60 players) conducted by Ian Brown, played six pieces which he introduced with great witty stories and included Handel’s Water Music, Coates’ London Again Suite and Walton’s Crown Imperial. David Burton, Leader of the Orchestra was brilliant in leading the very fast Enescu’s Romanian Rhapsody No. 1 with perfect timing too. The passion for the music was particularly seen from the cellists who seemed to make their cellos dance to the music. It was great to see young and old members working together to put on a fantastic show. Proceeds from the concert will be going to the Mayor’s charities, Sue Ryder, Headway Thames Valley, Oxfordshire Age UK, the Chiltern Centre and Riverside Counselling Services. During the second half there were special appearances by Henley’s Ukulele Quartet ‘No Direction’ which includes Peter McConnell, the Town Centre Manager and a performance by Naomi Vallance, a local singer/songwriter who performed at the Henley Fringe this year. At the start of the ‘Rule Britannia’ Julie Huntington, Chair of HAODS came out dressed in a fantastic ‘Proms’ dress (pictured above) accompanied by Stefan Gawrysiak, the Mayor who was dressed in a enormous union jack flag to the delight of the audience. Julie then led the singing and really got the audience singing along and waving their flags to this, Land of Hope and Glory and Elgar’s Jerusalem. This was probably the loudest singing the church had ever had between its great walls! https://www.henleyherald.com/wp-content/uploads/2013/09/proms-9.jpg 317 500 Editor https://www.henleyherald.com/wp-content/uploads/2012/11/logo-std.gif Editor2013-09-09 13:16:022016-07-30 17:09:35Last Night of the Proms… Mayor Rules Britannia!